Did Obama Double the Debt? Did President Obama Double Our National Debt? Who is the bigger fool….President Obama for doubling our national debt?…or the individual who believes such a canard? Like all political claims, the devil is in the details. More has been added to our national debt under President Obama than all the other presidents combined. Partially true. However, of the $6.4 trillion added to the National Debt from 2009 to 2014, only $800 billion is due legislation signed by President Obama. Of that $800 billion, none carried past 2010. The rest of the debt, or $5.6 trillion, can be directly attributed to legislation passed under previous administrations. On January 20, 2009 President Obama walked into the oval office and was handed a negative annual deficit of $1.3 trillion. This was a stark contrast from his predecessor, who began his eight years in office with a $200 billion dollar surplus. However, through healthcare entitlements, unfunded wars, wealth redistributing tax cuts, and TARP that surplus had turned into the largest fiscal deficit our country had ever experienced. Obama was handed this budgetary disaster, coupled with a collapsed economy with the expectation of immediate change. Little did he know six years later, he would be held responsible for the gap he inherited, and full blame for the skyrocketing debt. Before we can understand what Obama was expected to fix, we need to first understand where our government spends money. President Obama signed two major pieces of legislation that grew short and long term spending. In 2010 President Obama signed the American Recovery Act. This legislation accounts for $800B of new debt through $224b in entitlement spending, $275b in grants, and $288b in tax cuts over 2009 – 2010. 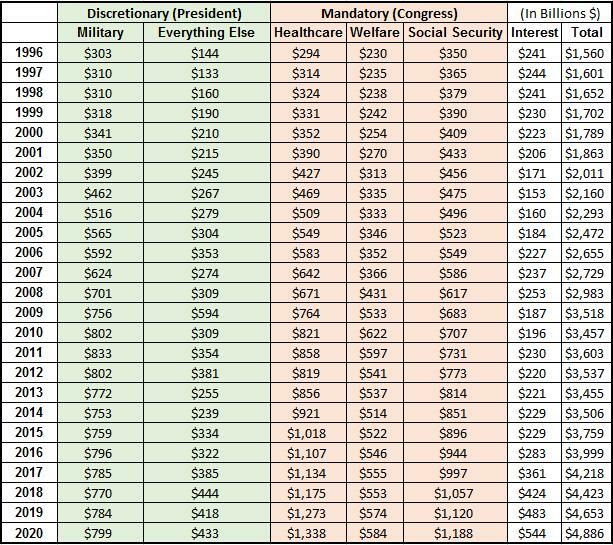 You can see these amounts reflected in the 2009 and 2010 budget lines in the “welfare” and “everything else” category spikes which declines the following years. The second piece of legislation that President Obama signed into law was the Patient Protection and Affordable Care Act, also known as Obamacare. In crafting the legislation, House Democrats worked closely with the Congressional Budget Office (CBO) to ensure the new legislation would remain deficit neutral. The potential increase in spending was offset by penalties (mandates), cost-savings, and some additional taxes directed at the super wealthy like “Cadillac” healthcare plans. Recent CBO reports confirm President Obama’s claims and Obamacare continues to be deficit neutral. The rest of the budget growth relies on legislated “stabilizers” that kick in based on marketplace conditions. For this reason these expenditures are known as “Mandatory” as only Congress can begin the process to change the programs. For example, spending on Social Security will continue to increase as more individuals reach the threshold, unless we restructure. Medicare costs will continue to skyrocket as more individuals reach the required age. Welfare costs have provided a little bit of favorability these past couple years, and should remain relatively flat going forward. The interest expense will continue to rise as more debt is issued to pay for all of these programs. This entire group has little to do with any of President Obama’s policies, and would be growing at the same rate regardless of who sat in the Oval Office. One of the most overlooked causes of our budgetary problem is due to governmental income, or receipts. Like our own household budget, when our income stays flat, so should our spending. Over the last decade this has not been the case. From 2000-2009, budgetary spending increased almost 96% and our nation’s receipts (income) only increased 3%. Imagine doubling your household spending after receiving a 3% pay raise! In 2000 receipts were roughly 20% of GDP. In 2009 receipts were 17% of GDP. If the 2014 receipts were equal to 2000 levels, our annual deficit would decline by $450 billion and be zero. What caused this shortfall in income? The collapse of the economy and the 2002/2003 tax cuts. In 2002 and 2003, tax cuts were signed into legislation based on the premise that the red hot economy of the 1990’s would continue through the next decade. The collapse of the housing market and war spending were not part of the equation, nor was TARP funding and other bailouts. Even more problematic was when President Obama extended these tax cuts compromising with the Republicans to avoid a governmental shutdown in 2013. Declining receipts due to the economic collapse is straight forward; less income tax is being collected due to unemployment and less is being spent by the consumer. You might be inclined to blame President Obama for the rising National Debt. However, if (fill-in-the-blank) GOP candidate takes office in 2016, he will have years of continuing rising deficits unless the big four spending categories are restructured. Why? Because minimal has been proposed in controlling rising spending, and any additional tax cuts will only expedite the problem. Of course the desire will be to blame President Obama, but that will fall on deaf ears due to lack of rhetoric consistency.